Three little books, see how they stand. 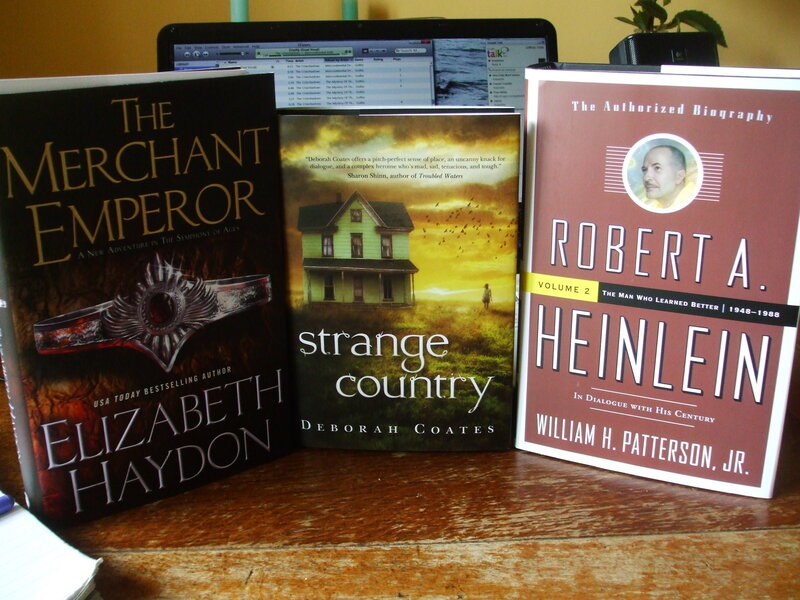 Elizabeth Haydon, THE MERCHANT EMPEROR, Deborah Coates, STRANGE COUNTRY, and the second volume of William H. Patterson Jr.’s biography of Robert A. Heinlein. I have no intention of reading the Haydon either, because I read Rhapsody and lo, it was terrible – I was still in my “Finish every book you start” phase of readership, and I very nearly didn’t make it to the end. So same goes. Postage and I’ll send it on. First come, first served. As for STRANGE COUNTRY: it’s a lovely book, the conclusion of Coates’ excellent debut rural fantasy series set in North Dakota. I recommend it highly, and I have already discussed it in a Sleeps With Monsters column this spring. It was the ARC I discussed, but this hardback is very shiny. You can’t have it. It’s MINE. This entry was posted in glamour and tagged books, Deborah Coates, Elizabeth Haydon, pictures, Robert A. Heinlein, Tor Books, William H. Patterson Jr.. Bookmark the permalink.